Wouldn’t it be great if you could put your company name or logo in front of thousands, tens of thousands, even hundreds of thousands of people and not have to pay much for it, if anything at all? Wouldn’t it be great if you could splash your company name or company logo across dozens, hundreds, even thousands of different websites? Wouldn’t it be great if you could build brand/business awareness and announce your existence to a broad spectrum of people who might very well be interesting in learning more about your company? I’m hoping you are answering yes. Wouldn’t it also be great if you could put the power of Google to work for you doing just this? Okay, then it’s time for you to implement Image Ads in your Google AdWords campaigns. Using Image Ads on Google’s vast content network, you can literally put your company’s name, your company’s logo, visual images of the products you are selling in front of hundreds of thousands of eyeballs. And the beauty of running a CPC Image Ad campaign on Google AdWords is that all these hundreds of thousands of impressions won’t cost you a dime unless someone actually clicks on your ad. 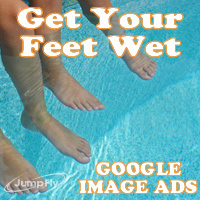 Here at JumpFly, we have seen many clients experience impressive results with Google Image Ads. Another plus is that your low click-thru rate on Google’s content network won’t negatively impact your regular search traffic quality scores, so if you do get hundreds of thousands of impressions and very few clicks it won’t work against you. Of course, you certainly want to get some clicks and sales out of these Image Ads, too. The good news is that conversion tracking does work with Image Ads, so you can track profitability as well as use this is a powerful branding mechanism. This season’s PPC Advertising Super Bowl Winner is Google AdWords Content Match. Just last season, the masses were scoffing at Content Match and its lackluster results. However, this season, that has all changed. Google AdWords Content Match has risen from relative obscurity to now offer many advertisers a valuable avenue for attaining clients. We’ve recently mentioned this before here at JumpFly, but now more than ever, Content Match has proven to be a successful and critical part of many advertisers’ campaigns. All account managers here at JumpFly have witnessed improved success rates with Content Match over the past six months. In fact, a handful of our clients actually receive 30 – 40% of their traffic and conversions from Content Match. One particularly useful recent AdWords enhancement, Placement Targeting, enables advertisers to reach specific targeted content partners. When properly identified, successful partners can be isolated and focused on. Just yesterday I was looking at an account we manage where one specific content partner is isolated in an ad group with a high bid due to its success, and this single content partner is responsible for providing the majority of overall conversions for this particular client. Properly identifying and reaching this particular content partner for this advertiser was critical and proved to be the major factor contributing to this client’s success. So if you have neglected to consider Content Match at Google, I suggest you reconsider. Content match advertising requires a different style setup than search engine advertising, and requires using different reports to fine tune and adjust results. However, the extra effort just might give your business the edge it needs to succeed in today’s increasingly challenging economy. Hopefully this highly coveted PPC Super Bowl victory will help give AdWords Content Match the respect it so badly deserves. Google just launched the new beta version of the Display Ad Builder Tool. This very cool new tool allows you to create and customize image, animated and Flash ads for the Google AdWords Content Network. To access this new tool, simply go to your content campaign. You do have separate campaigns for content don’t you? Then click the “Ad Variations” tab. Next to “Create new ad:” you will find the usual selections of: Text ad, Image ad, Local business ad, Mobile ad, Click-to-play video ad and the new Display Ad Builder. You really can’t miss it since it has NEW! in large red letters right next to it. Once inside the Display Ad Builder Tool you will find dozens of unique animated templates to use as your starting point. There are several pre-designed ad formats based on different industries like; travel, finance, automotive, ecommerce, etc. These all make excellent starting points for your new display ad, and Google promises to be releasing many more as the feature moves out of beta. After you pick your new template you will be taken to the page that allows you to customize the ad with all of your own information. There are text fields for headlines and descriptions, and you can easily change the font colors if you wish. As you proceed, there is a button labeled “update preview” located underneath the ad, and you will want to periodically click this button to see the results of your modifications. Tip* Depending on the template, you may need to have some custom logos and product images available. If your logo’s file size is too large, you may need to reduce it to the maximum size shown. Usually this is about 50k. If this seems too daunting of a task, simply choose one of the other templates that does not display a logo. There are plenty to choose from. So, you have customized your new display ad. The next step is to click “Continue” located at the bottom of the page. You are now on the preview and ad variations page. As you will see, the Display Ad Builder Tool automatically generates your new ad into several of the common sizes including medium and large rectangles, leader boards, as well as the popular skyscraper formats. Different templates are automatically converted to different sizes, so depending on the template you have chosen, you may or may not see all of the formats mentioned. If something doesn’t look correct, you will want to click back and adjust as needed. If it looks good, click “save ad” and you now have impressive new animated display ads running in your content campaign. Many AdSense websites do not have layouts that accommodate these display ad formats, so you will always want to have text ad versions available in your campaign. I have found that in some of the AdWords accounts that I manage, display ads perform very well with higher CTRs than the text ads. In some of my accounts they simply do not see enough volume. Give the Display Ad Builder a try and see how it works for you. You may want to monitor results using Placement Performance Reports. Creating Google AdWords Content Network Campaigns requires a unique strategy and keyword list. Contact a qualified PPC Account Manager to discuss your content campaign.